Tragedy (from the Greek: τραγῳδία, tragōidia) is a form of drama based on human suffering that invokes in its audience an accompanying catharsis or pleasure in the viewing. While many cultures have developed forms that provoke this paradoxical response, the term tragedy often refers to a specific tradition of drama that has played a unique and important role historically in the self-definition of Western civilization. That tradition has been multiple and discontinuous, yet the term has often been used to invoke a powerful effect of cultural identity and historical continuity—"the Greeks and the Elizabethans, in one cultural form; Hellenes and Christians, in a common activity," as Raymond Williams puts it. From its obscure origins in the Hegel, Schopenhauer, Kierkegaard, Nietzsche, Freud, Benjamin, Camus, Lacan, and Deleuze—have analysed, speculated upon, and criticised the tragic form. In the wake of Aristotle's Poetics (335 BCE), tragedy has been used to make genre distinctions, whether at the scale of poetry in general (where the tragic divides against epic and lyric) or at the scale of the drama (where tragedy is opposed to comedy). In the modern era, tragedy has also been defined against drama, melodrama, the tragicomic, and epic theatre. Drama, in the narrow sense, cuts across the traditional division between comedy and tragedy in an anti- or a-generic deterritorialization from the mid-19th century onwards. Both Bertolt Brecht and Augusto Boal define their epic theatre projects (non-Aristotelian drama and Theatre of the Oppressed respectively) against models of tragedy. Taxidou, however, reads epic theatre as an incorporation of tragic functions and its treatments of mourning and speculation. The word "tragedy" appears to have been used to describe different phenomena at different times. It derives from Classical Greek τραγῳδία, contracted from trag(o)-aoidiā = "goat song", which comes from tragos = "he-goat" and aeidein = "to sing" (cf. "ode"). Scholars suspect this may be traced to a time when a goat was either the prize in a competition of choral dancing or was that around which a chorus danced prior to the animal's ritual sacrifice. In another view on the etymology, Athenaeus of Naucratis (2nd–3rd century CE) says that the original form of the word was trygodia from trygos (grape harvest) and ode (song), because those events were first introduced during grape harvest. Anyway, arising from an improvisatory beginning (both tragedy and comedy—tragedy from the leaders of the dithyramb, and comedy from the leaders of the phallic processions which even now continue as a custom in many of our cities), [tragedy] grew little by little, as [the poets] developed whatever [new part] of it had appeared; and, passing through many changes, tragedy came to a halt, since it had attained its own nature. Tragedy is, then, an enactment of a deed that is important and complete, and of [a certain] magnitude, by means of language enriched [with ornaments], each used separately in the different parts [of the play]: it is enacted, not [merely] recited, and through pity and fear it effects relief (catharsis) to such [and similar] emotions. Taplin, Oliver; Billings, Joshua, What is Tragedy? (podcast), . Aristotle, Poetics (online ed. ), Tufts . ——— (1987), Poetics with Tractatus Coislinianus, Reconstruction of Poetics II and the Fragments of the On Poets, Janko, Richard trans, Cambridge: Hackett, . Banham, Martin, ed. (1998), The Cambridge Guide to Theatre, Cambridge: Cambridge UP, . Brockett, Oscar Gross; Hildy, Franklin Joseph (2003), History of the theatre (9th, ill ed. ), Allyn & Bacon, . Carlson, Marvin (1993), Theories of the Theatre: A Historical and Critical Survey from the Greeks to the Present (expanded ed. ), Ithaca and London: Cornell UP, . Dukore, ed. (1974), Dramatic Theory and Criticism: Greeks to Grotowski . Felski, Rita, ed. (2008), Rethinking Tragedy, Baltimore: Johns Hopkins UP, . Headington, Christopher; Westbrook, Roy; Barfoot, Terry (1991), Opera: a History, Arrow, p. 22 . Ley, Graham (2007), A Short Introduction to the Ancient Greek Theater (rev ed. ), University of Chicago Press, . Pfister, Manfred (1988) , The Theory and Analysis of Drama, European Studies in English Literature, Halliday, John trans, Cambridge: Cambridge UP, . Sorkin, Nancy (2008), Greek Tragedy, Introductions to the Classical World, Malden, MA: Blackwell, . Geuss, Raymond; Speirs, Ronald, eds. (1999) , . Taxidou, Olga (2004), Tragedy, Modernity and Mourning, Edinburgh: Edinburgh UP, . ^ a b Banham 1998, p. 1118. ^ Nietzsche 1999, p. 21: ‘two-fold mood[…] the strange mixture and duality in the affects of the Dionysiac enthusiasts, that phenomenon whereby pain awakens pleasure while rejoicing wrings cries of agony from the breast. From highest joy there comes a cry of horror or a yearning lament at some irredeemable loss. In those Greek festivals there erupts what one might call a sentimental tendency in nature, as if it had cause to sigh over its dismemberment into individuals’. ^ Williams 1966, pp. 14–16. ^ Williams 1966, p. 16. ^ Williams 1966, pp. 13–84. ^ a b Taxidou 2004, pp. 193–209. ^ Deleuze & Guattari 1972. ^ Felski 2008, p. 1. ^ Dukore 1974: primary material. ^ a b Carlson 1993: analysis. ^ See Horace, Epistulae, II, 3, 220: "Carmino qui tragico vilem certavit ob hircum". ^ a b Brockett & Hildy 2003, p. 13. ^ Janko 1987, p. 6. ^ Brown 1998, p. 441. ^ Cartledge 1997, pp. 3–5. ^ Goldhill 1997, p. 54. ^ Ley 2007, p. 206. ^ Styan 2000, p. 140. ^ Taxidou 2004, p. 104: “most scholars now call 'Greek' tragedy 'Athenian' tragedy, which is historically correct”. ^ Brockett & Hildy 2003, pp. 32–3. ^ Brown 1998, p. 444. ^ Cartledge 1997, pp. 3–5, 33: [although Athenians of the 4th century judged Aeschylus, Sophocles, and Euripides "as the nonpareils of the genre, and regularly honored their plays with revivals, tragedy itself was not merely a 5th-century phenomenon, the product of a short-lived golden age. If not attaining the quality and stature of the fifth-century 'classics', original tragedies nonetheless continued to be written and produced and competed with in large numbers throughout the remaining life of the democracy—and beyond it". ^ a b Brockett & Hildy 2003, p. 15. ^ Kovacs 2005, p. 379. ^ Walton 1997, pp. viii, xix. ^ Ley 2007, p. 33–34. ^ a b Brockett & Hildy 2003, p. 43. ^ Brockett & Hildy 2003, pp. 36, 47. ^ a b Brockett & Hildy 2003, p. 47. ^ Brockett & Hildy 2003, p. 49. ^ a b Brockett & Hildy 2003, pp. 50. ^ Brockett & Hildy 2003, pp. 49–50. ^ "Lovati, Lovato de'", Treccani: Enciclopedie on line (in Italian). Accessed March 2013. ^ "Mussato, Albertino", Treccani: Enciclopedie on line (in Italian). Accessed March 2013. ^ Henry Hallam (1837) Introduction to the Literature of Europe in the Fifteenth, Sixteenth and Seventeenth Centuries. Paris: Baudry's European Library, p. 212. ^ "Del Carretto, Galeotto, dei marchesi di Savona", Treccani: Enciclopedie on line (in Italian). Accessed March 2013. ^ Headington, Westbrook & Barfoot 1991, p. 22. ^ Headington, Westbrook & Barfoot 1991, p. 178. ^ Chiari, J. Landmarks of Contemporary Drama. London: Jenkins, 1965. Page 41. ^ Bradley 2007, pp. 114–56. ^ Hegel 1927, pp. 567–8. ^ Hegel 1927, p. 572. ^ We have seven by Aeschylus, seven by Sophocles, and eighteen by Euripides. In addition, we also have the Cyclops, a satyr play by Euripides. Some critics since the 17th century have argued that one of the tragedies that the classical tradition gives as Euripides'—Rhesus—is a 4th-century play by an unknown author; modern scholarship agrees with the classical authorities and ascribes the play to Euripides. This uncertainty accounts for Brockett and Hildy's figure of 31 tragedies. ^ The theory that Prometheus Bound was not written by Aeschylus adds a fourth, anonymous playwright to those whose work survives. ^ For more information on the ancient Roman dramatists, see the articles categorised under "Ancient Roman dramatists and playwrights" in WorldHeritage. The celebrated ancient Indian epic, Mahabharata, can also be related to tragedy in some ways. According to Hermann Oldenberg, the original epic once carried an immense "tragic force". It was common in Sanskrit drama to adapt episodes from the Mahabharata into dramatic form. The writer Bharata Muni, in his work on dramatic theory A Treatise on Theatre (Sanskrit: Nātyaśāstra, नाट्य शास्त्र, c. 200 BCE – 200 CE), identified several rasas (such as pity, anger, disgust and terror) in the emotional responses of audiences for the Sanskrit drama of ancient India. The text also suggests the notion of musical modes or jatis which are the origin of the notion of the modern melodic structures known as ragas. Their role in invoking emotions are emphasized; thus compositions emphasizing the notes gandhara or rishabha are said to provoke "sadness" or "pathos" (karuna rasa) whereas rishabha evokes heroism (vira rasa). Jatis are elaborated in greater detail in the text Dattilam, composed around the same time as the Treatise. Aristotle and even more by modern pessimists. Tragedy is so far from being a proof of the pessimism (in Schopenhauer's sense) of the Greeks that it may, on the contrary, be considered a decisive rebuttal and counterexample. Saying Yes to life even in its strangest and most painful episodes, the will to life rejoicing in its own inexhaustible vitality even as it witnesses the destruction of its greatest heroes — that is what I called Dionysian, that is what I guessed to be the bridge to the psychology of the tragic poet. Not in order to be liberated from terror and pity, not in order to purge oneself of a dangerous affect by its vehement discharge — which is how Aristotle understood tragedy — but in order to celebrate oneself the eternal joy of becoming, beyond all terror and pity — that tragic joy included even joy in destruction." Nietzsche, another German philosopher, dedicated his first full-length book, The Birth of Tragedy (1872), to a discussion of the origins of Greek tragedy. He traced the evolution of tragedy from early rituals, through the joining of Apollonian and Dionysian forces, until its early "death" in the hands of Socrates. In opposition to Schopenhauer, Nietzsche viewed tragedy as the art form of sensual acceptance of the terrors of reality and rejoicing in these terrors in love of fate (amor fati), and therefore as the antithesis to the Socratic Method, or the belief in the power of reason to unveil any and all of the mysteries of existence. Ironically, Socrates was fond of quoting from tragedies. Hegel's comments on a particular play may better elucidate his theory: "Viewed externally, Hamlet's death may be seen to have been brought about accidentally... but in Hamlet's soul, we understand that death has lurked from the beginning: the sandbank of finitude cannot suffice his sorrow and tenderness, such grief and nausea at all conditions of life... we feel he is a man whom inner disgust has almost consumed well before death comes upon him from outside." Common usage of tragedy refers to any story with a sad ending, whereas to be an Aristotelian tragedy the story must fit the set of requirements as laid out by Poetics. By this definition social drama cannot be tragic because the hero in it is a victim of circumstance and incidents that depend upon the society in which he lives and not upon the inner compulsions — psychological or religious — which determine his progress towards self-knowledge and death. Exactly what constitutes a "tragedy", however, is a frequently debated matter. which means Tragedy is an imitation of an action that is admirable, complete (composed of an introduction, a middle part and an ending), and possesses magnitude; in language made pleasurable, each of its species separated in different parts; performed by actors, not through narration; effecting through pity and fear the purification of such emotions. "Ἔστιν οὖν τραγῳδία μίμησις πράξεως σπουδαίας καὶ τελείας μέγεθος ἐχούσης, ἡδυσμένῳ λόγῳ χωρὶς ἑκάστῳ τῶν εἰδῶν ἐν τοῖς μορίοις, δρώντων καὶ οὐ δι᾽ ἀπαγγελίας, δι᾽ ἐλέου καὶ φόβου περαίνουσα τὴν τῶν τοιούτων παθημάτων κάθαρσιν." In addition, the tragic hero may achieve some revelation or recognition (anagnorisis--"knowing again" or "knowing back" or "knowing throughout") about human fate, destiny, and the will of the gods. Aristotle terms this sort of recognition "a change from ignorance to awareness of a bond of love or hate." According to Aristotle, "the structure of the best tragedy should not be simple but complex and one that represents incidents arousing fear and pity—for that is peculiar to this form of art." This reversal of fortune must be caused by the tragic hero's hamartia, which is often mistranslated as a character flaw, but is more correctly translated as a mistake (since the original Greek etymology traces back to hamartanein, a sporting term that refers to an archer or spear-thrower missing his target). According to Aristotle, "The change to bad fortune which he undergoes is not due to any moral defect or flaw, but a mistake of some kind." The reversal is the inevitable but unforeseen result of some action taken by the hero. It is also a misconception that this reversal can be brought about by a higher power (e.g. the law, the gods, fate, or society), but if a character’s downfall is brought about by an external cause, Aristotle describes this as a misadventure and not a tragedy. Aristotle wrote in his work Poetics that tragedy is characterized by seriousness and involves a great person who experiences a reversal of fortune (Peripeteia). Aristotle's definition can include a change of fortune from bad to good as in the Eumenides, but he says that the change from good to bad as in Oedipus Rex is preferable because this induces pity and fear within the spectators. Tragedy results in a catharsis (emotional cleansing) or healing for the audience through their experience of these emotions in response to the suffering of the characters in the drama. Bourgeois tragedy (German: Bürgerliches Trauerspiel) is a form that developed in 18th-century Europe. It was a fruit of the Gotthold Ephraim Lessing's play Miss Sara Sampson, which was first produced in 1755, is said to be the earliest Bürgerliches Trauerspiel in Germany. For more on French tragedy of the 16th and 17th centuries, see French Renaissance literature and French literature of the 17th century. Jean Racine's tragedies—inspired by Greek myths, Euripides, Sophocles and Seneca—condensed their plot into a tight set of passionate and duty-bound conflicts between a small group of noble characters, and concentrated on these characters' double-binds and the geometry of their unfulfilled desires and hatreds. Racine's poetic skill was in the representation of pathos and amorous passion (like Phèdre's love for her stepson) and his impact was such that emotional crisis would be the dominant mode of tragedy to the end of the century. Racine's two late plays ("Esther" and "Athalie") opened new doors to biblical subject matter and to the use of theatre in the education of young women. Racine also faced criticism for his irregularities: when his play, Bérénice, was criticised for not containing any deaths, Racine disputed the conventional view of tragedy. Contemporary with Shakespeare, an entirely different approach to facilitating the rebirth of tragedy was taken in Italy. 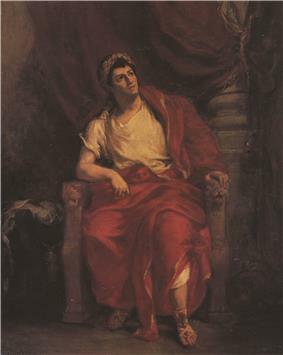 Jacopo Peri, in the preface to his Euridice refers to "the ancient Greeks and Romans (who in the opinion of many sang their staged tragedies throughout in representing them on stage)." The attempts of Peri and his contemporaries to recreate ancient tragedy gave rise to the new Italian musical genre of opera. In France, tragic operatic works from the time of Lully to about that of Gluck were not called opera, but tragédie en musique ("tragedy in music") or some similar name; the tragédie en musique is regarded as a distinct musical genre. Some later operatic composers have also shared Peri's aims: Richard Wagner's concept of Gesamtkunstwerk ("integrated work of art"), for example, was intended as a return to the ideal of Greek tragedy in which all the arts were blended in service of the drama. Nietzsche, in his The Birth of Tragedy (1872) was to support Wagner in his claims to be a successor of the ancient dramatists. From about 1500 printed copies, in the original languages, of the works of Sophocles, Seneca, and Euripides, as well as comedic writers such as Aristophanes, Terence and Plautus, were available in Europe and the next forty years saw humanists and poets translating and adapting their tragedies. In the 1540s, the European university setting (and especially, from 1553 on, the Jesuit colleges) became host to a Neo-Latin theatre (in Latin) written by scholars. The influence of Seneca was particularly strong in its humanist tragedy. His plays, with their ghosts, lyrical passages and rhetorical oratory, brought a concentration on rhetoric and language over dramatic action to many humanist tragedies. In 1515 vernacular that would later be called Italian. Drawn from Livy's account of Sophonisba, the Carthaginian princess who drank poison to avoid being taken by the Romans, it adheres closely to classical rules. It was soon followed by the Oreste and Rosmunda of Trissino's friend, the Florentine Giovanni di Bernardo Rucellai (1475–1525). Both were completed by early 1516 and are based on classical Greek models, Rosmunda on the Hecuba of Euripides, and Oreste on the Iphigenia in Tauris of the same author; like Sophonisba, they are in Italian and in blank (unrhymed) hendecasyllables. Although these three are often cited, separately or together, as being the first regular tragedies in modern times, as well as the earliest substantial works to be written in blank hendecasyllables, they were apparently preceded by two other works in the vernacular: Pamfila or Filostrato e Panfila written in 1498 or 1508 by Antonio Cammelli (Antonio da Pistoia); and a Sophonisba by Galeotto del Carretto of 1502. Classical Greek drama was largely forgotten in Western Europe from the Middle Ages to the beginning of the 16th century. Medieval theatre was dominated by mystery plays, morality plays, farces and miracle plays. In Italy, the models for tragedy in the later Middle Ages were Roman, particularly the works of Seneca, interest in which was reawakened by the Paduan Lovato de' Lovati (1241–1309). His pupil Albertino Mussato (1261–1329), also of Padua, in 1315 wrote the Latin verse tragedy Eccerinis, which uses the story of the tyrant Ezzelino III da Romano to highlight the danger to Padua posed by Cangrande della Scala of Verona. It was the first secular tragedy written since Roman times, and may be considered the first Italian tragedy identifiable as a Renaissance work. De casu caesenae, a contemporary account in Latin prose by Lodovico da Fabriano of Perugia of the sack in February 1377 of the city of Cesena and the massacre of its inhabitants by Breton mercenaries led by Giovanni Acuto (the English-born condottiere John Hawkwood), under the command of Robert, Cardinal of Geneva, is entitled "tragedy" by some copyists. The earliest tragedies to employ purely classical themes are the Achilles written before 1390 by Antonio Loschi of Vicenza (c.1365–1441) and the Progne of the Venetian Gregorio Correr (1409–1464) which dates from 1428–29. Seneca's tragedies rework those of all three of the Athenian tragic playwrights whose work has survived. Probably meant to be recited at elite gatherings, they differ from the Greek versions in their long declamatory, narrative accounts of action, their obtrusive moralizing, and their bombastic rhetoric. They dwell on detailed accounts of horrible deeds and contain long reflective soliloquies. Though the gods rarely appear in these plays, ghosts and witches abound. Senecan tragedies explore ideas of revenge, the occult, the supernatural, suicide, blood and gore. The Renaissance scholar Julius Caesar Scaliger (1484–1558), who knew both Latin and Greek, preferred Seneca to Euripides. From the time of the empire, the tragedies of two playwrights survive—one is an unknown author, while the other is the Stoic philosopher Seneca. Nine of Seneca's tragedies survive, all of which are fabula crepidata (tragedies adapted from Greek originals); his Phaedra, for example, was based on Euripides' Hippolytus. Historians do not know who wrote the only extant example of the fabula praetexta (tragedies based on Roman subjects), Octavia, but in former times it was mistakenly attributed to Seneca due to his appearance as a character in the tragedy. Following the expansion of the Roman Republic (509–27 BCE) into several Greek territories between 270–240 BCE, Rome encountered Greek tragedy. From the later years of the republic and by means of the Roman Empire (27 BCE-476 CE), theatre spread west across Europe, around the Mediterranean and even reached England. While Greek tragedy continued to be performed throughout the Roman period, the year 240 BCE marks the beginning of regular Roman drama. Livius Andronicus began to write Roman tragedies, thus creating some of the first important works of Roman literature. Five years later, Gnaeus Naevius also began to write tragedies (though he was more appreciated for his comedies). No complete early Roman tragedy survives, though it was highly regarded in its day; historians know of three other early tragic playwrights—Quintus Ennius, Marcus Pacuvius and Lucius Accius. Many ancient Greek tragedians employed the ekkyklêma as a theatrical device, which was a platform hidden behind the scene that could be rolled out to display the aftermath of some event which had happened out of sight of the audience. This event was frequently a brutal murder of some sort, an act of violence which could not be effectively portrayed visually, but an action of which the other characters must see the effects in order for it to have meaning and emotional resonance. A prime example of the use of the ekkyklêma is after the murder of Agamemnon in the first play of Aeschylus' Oresteia, when the king's butchered body is wheeled out in a grand display for all to see. Variations on the ekkyklêma are used in tragedies and other forms to this day, as writers still find it a useful and often powerful device for showing the consequences of extreme human actions. Another such device was a crane, the mechane, which served to hoist a god or goddess on stage when they were supposed to arrive flying. This device gave origin to the phrase "deus ex machina" ("god out of a machine"), that is, the surprise intervention of an unforeseen external factor that changes the outcome of an event. All of the choral parts were sung (to the accompaniment of an aulos) and some of the actors' answers to the chorus were sung as well. The play as a whole was composed in various verse metres. All actors were male and wore masks. A Greek chorus danced as well as sang, though no one knows exactly what sorts of steps the chorus performed as it sang. Choral songs in tragedy are often divided into three sections: strophe ("turning, circling"), antistrophe ("counter-turning, counter-circling") and epode ("after-song"). 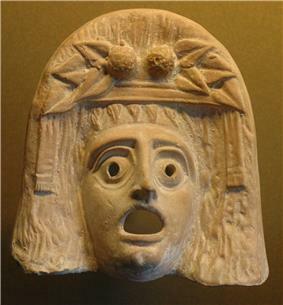 Athenian tragedies were performed in late March/early April at an annual state religious festival in honor of Dionysus. The presentations took the form of a contest between three playwrights, who presented their works on three successive days. 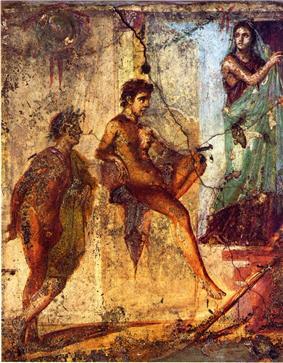 Each playwright offered a tetralogy consisting of three tragedies and a concluding comic piece called a satyr play. The four plays sometimes featured linked stories. Only one complete trilogy of tragedies has survived, the Oresteia of Aeschylus. The Greek theatre was in the open air, on the side of a hill, and performances of a trilogy and satyr play probably lasted most of the day. Performances were apparently open to all citizens, including women, but evidence is scant. The theatre of Dionysus at Athens probably held around 12,000 people. Athenian tragedy—the oldest surviving form of tragedy—is a type of dance-drama that formed an important part of the theatrical culture of the city-state. Having emerged sometime during the 6th century BCE, it flowered during the 5th century BCE (from the end of which it began to spread throughout the Greek world), and continued to be popular until the beginning of the Hellenistic period. No tragedies from the 6th century and only 32 of the more than a thousand that were performed in the 5th century have survived. We have complete texts extant by Aeschylus, Sophocles, and Euripides.